Warrant Officer 1st Class Stanley Angus MacKay was the son of John Murray and Isabelle McCorquodale of Lot 2 Concession 14 in East Nissouri Township. A mechanic by trade, Stanley owned a garage in Thamesford, Ontario. During WW1 he was drafted and trained for three weeks at Woseley Barracks just before the war ended. 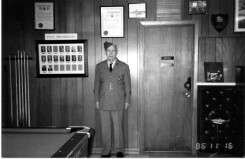 In 1939 Stanley enlisted with the Royal Canadian Air Force. He was an airplane mechanic stationed at Moncton, New Brunswick. He served from September 1939 to 1948 in St. Thomas, and at Crumlin at Central Aircraft, and Moncton, New Brunswick. Stanley married Nina Saul. They lived in Thamesford and raised their nine children there. Years later he was always proud of how he could still fit into his uniform. He is buried in the North Embro Cemetery.